It's been a while since we've had a Batman film we can love, says Raja Sen. Created by Bill Finger and Bob Kane in 1939, the crimefighting vigilante has had a varied and sprawling mythology. With many a writer and filmmaker desperate to leave their own stamp on the shadowy character, the years have seen him turned into a simultaneous embodiment of both ridicule and high cool. Classic superheroes usually stick to their personality type, but Bats has often had his very disposition overhauled -- enough to make him the most schizophrenic of superheroes. The Lego Batman Movie takes this head on. Unlike other Bat movies that singled out aspects of his psyche, this delirious little film by Chris McKay aims for the entire utility belt and goes for them all. It's frantic, it's dynamic, it's self-referential and clever and cheerful, but, most importantly, as Batman says, it bets on black. Like no movie before it. It's every Batman. It also bets on Bojack. The film opens with the word 'Black' said on a black screen as Will Arnett, who voices the superhero, speaks of important movies starting with black screens, wonders aloud why Warner wouldn't just say Brothers instead of saying 'Bros' on their logo, approves of the 'macho' logo for RatPac production... all this before the film has started. This moment feels like watching the opening of This Is Spinal Tap with the DVD commentary on -- and that, to me, is the highest conceivable praise. Arnett, who has miraculously brought alive Bojack Horseman on Netflix, perhaps the most messed up animated character in television history (external link), is an overwhelmingly fine choice for this screwy part. Gravel-voiced and relentlessly self-celebrating, Arnett's Batman is irresistible and imperious and oddly credible even when singing about how he does the sickest backflips. This Batman sings as he works, glorifying himself as if he were also his own Bat-Minstrel, but -- tellingly -- he makes sure that even songs heralding his own awesomeness always leave room for a solo he obviously plays himself, be it a guitar solo or a beatboxing solo. This is a man who may be Elvis, but wants also to be every single Beatle. 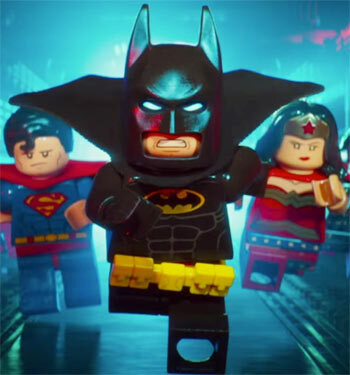 There is much mocking of gargantuan cinematic action set pieces during this sequence as Lego blocks crash and tumble colourfully against each other, threatening to break Gotham City apart. Naturally, this plan is foiled by the adorable but insufferably smug Batman who then deals The Joker the cruellest blow. Grandstanding as Batman's greatest enemy, the Joker is told that he's nothing of the sort. "I'm fighting a few different people," Batman admits, an ever-so-slight sheepishness in his growl. "I like to fight around." We watch The Joker's heart break and, while the relationship jokes might seem juvenile, this soon develops into the most mature and compelling take on the Yin and Yang dynamic between Batman and The Joker that has been put on screen. Alan Moore, bearded writer of The Killing Joke and full-time loather of DC cinema, would be proud. The film bravely and brilliantly offers other perceptive insights -- like the way Batman has, over the years, ruined Gotham City instead of fixing it -- and while there is much here to laugh at, there is also a lot that cuts deep. The jokes are superb. This is stellar writing, better even than the Deadpool movie and -- quite honestly -- superior to what Frank Miller, who changed Bat mythology forever with The Dark Knight and The Dark Knight Returns, did with the world's greatest detective. This film understands its hero. It has a masterful grip on the character and doesn't let go, even as the odds ratchet unprecedentedly higher. Voldemort and Sauron show up, for God's sake. Yet, impressively enough, for once, all the unbelievable climactic excess feels great. It feels earned, because of a rollicking non-stop plot, because of great characters, and it feels -- exactly -- like the explosion that takes place when you and your friends all used to bring every single toy to the same living room. This is a movie you should stumble into as unprepared as possible, and while you have already almost read this review to the end, let me reassure you that -- as Batman says, aghast at the thought that someone could consider all his adventures finite — "I haven't told you everything." It's been a while since we've had a Batman film we can love. We each have our favourites -- and to me Tim Burton's Batman edges out Christopher Nolan's The Dark Knight, with the deft animated film The Mask Of The Phantasm sandwiched between the two -- but what The Lego Batman Movie underlines is the fact that, despite all our differences of opinion, this is a truly iconic character and we revel in his absolute awesomeness. This is a film about how we all -- Batman included, obviously -- love something about the Batman, and it celebrates all of it. Even the shark-repellent. The magic lies in all those bricks coming together with a profoundly satisfying click.